Al Zorah Golf Villas ... serene. Work is well in progress on Phase One of Al Zorah, a distinctive waterfront tourist and lifestyle destination taking shape in Ajman, which last month launched the sale of its premium Al Zorah Golf Villas. The project is being developed by the Government of Ajman in partnership with Lebanon’s Solidere International. The first phase comprises four marinas, two world-class beachfront hotels and resorts, an 18-hole golf course and clubhouse, 42 golf villas, serviced residential apartments, a boardwalk, a beach club and a wellness centre, according to Imad Dana, chief executive officer of Al Zorah Development Company, which is spearheading its development. Construction of the villas is well under way and is expected to be completed by mid-2016, with the first residents expected to move in by early 2016. All the villas overlook the Jack Nicklaus-designed golf course. Sheikh Humaid bin Rashid Al Nuaimi, UAE supreme council member and Ruler of Ajman toured the project recently, endorsing it as an integral part of Ajman’s vision in transforming the emirate into one with a green economy that provides the best opportunities, while preserving the environment. Located along the breathtaking natural peninsula on the coastline of Ajman, Al Zorah blends the best of nature with the finest in modern amenities. Spread over an area of 5.4 million sq m, the development is set apart from other destinations by its exotic setting of natural mangroves and seafront. A freehold development encompassing 12 km of waterfront, 1.6 km of sandy beaches and a 700,000-sq-m golf course, Al Zorah is slowly rising up from the ground to create communal living close to nature. The project is masterfully crafted and planned by Solidere International, part of Solidere, the Lebanese public company that is responsible for the urban regeneration of downtown Beirut. Featuring rooftop terraces and set right on the Al Zorah Golf Course, the Golf Villas are a distinctive gated community. 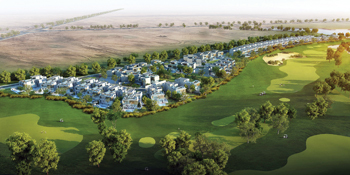 Residents will have a high-end golf course at their backyard unlike other developments that simply overlook the course as well as access to other sports and leisure activities within Al Zorah. The entire community is interconnected with the course and the mangroves which lend a feel of living in natural surroundings. Construction work in progress on site. The elegant white architecture of the villas contrasts with the green surroundings with custom designs that offer rolling outdoor views onto the golf course. Semi-enclosed courtyards provide secondary open-air living spaces. Work on the golf course is expected to be complete by end of this year. The site’s natural beauty establishes the foundations for an eco-friendly lifestyle with 60 per cent of the land area devoted to protected mangroves and public space. The overall project is divided in five districts: Gates, Shores, Avenues, Coves and Fairways. The Gates is the entrance of Al Zorah from Sheikh Mohammed Bin Sayed Road, where the highway transforms into a landscaped boulevard with retail amenities. The Shores will accommodate high-end resorts and serviced residences, a beach club and boardwalk, beachfront residential serviced apartments and villas. The Avenues, connected by a pedestrian retail and leisure spine, comprises an entertainment complex, a marina, Al Zorah suqs and a retail centre. The Coves is a residential and hotel quarter planned as a calm high-end neighbourhood with direct access to the waterfront promenade and magnificent views of the creek and mangroves. The Fairways is set within coastal dunes and the mangrove wetlands. It also boasts a clubhouse, wellness spa, upscale residential villas and apartments. The apartments include the Linear Park and the Marina Square residences. Linear Park offers serviced apartments with sea views and private amenities, including a panoramic swimming pool and first-class gym. These serviced apartments are located within a landscaped area with a short pedestrian path linking them directly to the resorts, beach, and marinas. The Marina Square comprises family-oriented waterfront serviced apartments, benefiting from access to all the amenities and facilities of the resort. • The Mangroves: Al Zorah is surrounded by a tidal lagoon, an inland creek extending over 2 sq km of biologically and ecologically rich wetland. 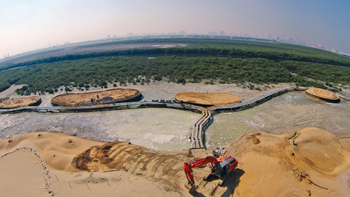 The creek and mangrove are designated as conservation areas and Al Zorah says it is committed to preserve the ecosystem. • Hotels: Al Zorah will include six world-class resorts and boutique hotels, of which two are currently being developed as part of Phase One. The flagship hotels in the integrated mixed-use development will be the Oberoi Al Zorah which will feature 113 guestrooms suites, 290 m of beachfront, a wellness spa, restaurants and swimming pools; and Lux Al Zorah which will feature 193 rooms, suites and villas, with 260 m of beachfront and a number of entertainment options. • Golf course: Al Zora’s 18-hole golf course, by Nicklaus Design, is located within a naturally preserved environment of native sandy areas and mangroves. The par-72, 18-hole landscaped green has extensive practice facilities, and is crafted with generous fairways and wide corridors around two large lakes that enrich the challenge of the course and enhance its variety and playability. Switzerland-based Tron Golf, the world’s leading high-end golf development company, will operate and manage the project. The clubhouse will feature a state-of-the-art gym, restaurant with beautiful views over the golf course, a swimming pool, a children’s pool, coffee shop, multipurpose conference room and a youth club. • Wellness centre: A wellness centre and health spa will create an oasis of tranquility away from a fast-paced urban lifestyle. From professional therapeutic massages to beauty treatments, the wellness centre will offer stress management, weight control, nutritional and exercise programmes, paving the way to a healthier lifestyle. • Beach club: Located on the water, the beach club offers food and beverages outlets, a nightclub, a spa, a fitness centre, and separate outdoor pools for adults and children with lounging areas. • Boardwalk: This is a pedestrian spine serving as a daytime and night-time destination accommodating a mix of retail outlets, restaurants and nightclubs. • Beachfront residences: Elevated on a plateau that blends into the landscape, this residential complex comprise a large internal courtyard, private gardens, and courtyards overlooking the beach. The project is being developed by Al Zorah Development Company based on a vision and a masterplan prepared by Solidere International.